Gold is a regarded as a hedge against market turbulence by Bank of America who, in a note to clients, advised holding gold and paper currency at this time. Bloomberg report that Bank of America Merrill Lynch describe the markets as being in a “Twilight Zone” – the zone between the end of QE and the Fed beginning to raise rates to try to bring normality back into the markets. The note highlights two problems with raising rates which are prolonging this sojourn in the Twilight Zone. The first is that the real economy in the U.S. is not currently strong enough to withstand a rise in interest rates. The second is that raising rates could cause a shock to the markets and the economy as the practically free money juicing the markets comes at a more realistic cost and some government, corporate and household debts become unserviceable. The note also indicates that data shows that the stock markets in the U.S. are somewhat disconnected from reality. While investors are apparently optimistic there is a large amount of cash “on the sidelines”. Their chart shows that the high levels of cash currently in reserve actually correspond to periods of extreme pessimism in recent years. They note the anomaly of near record high stock prices while equity funds haemorrhage cash. “U.S. 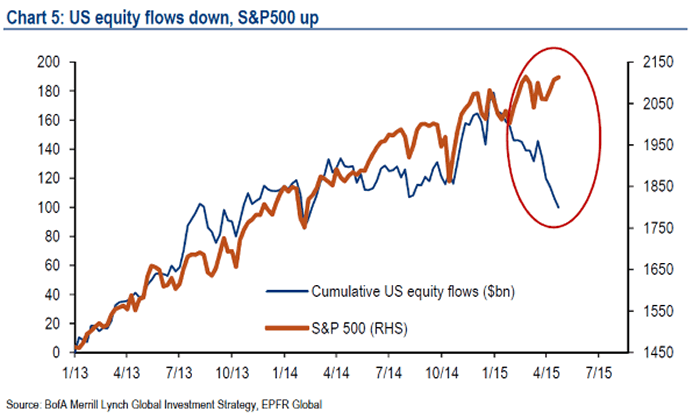 equity funds have suffered $100 billion of outflows in 2015 while the S&P 500 is near all-time highs”. They put the outflow down to U.S. investors putting cash into European and Japanese equities. For a host of disparate reasons we cover here consistently – ranging from geopolitical tensions and currency wars to gargantuan unpayable debt and other macro-economic fundamentals – we believe the entire interconnected global economic, financial and monetary systems to be extremely fragile. As policy makers lurch from crisis to crisis it seems certain that, at some point, their ability to control the outcome of a particular shock will be wanting. History shows that crises usually spring from seemingly minor events. A correction in the stock markets – should it occur – may turn out to be a “cleansing”. But it may precipitate a larger, unforeseen crisis given the fragile state of the system. In the event of such a crisis – and given the insane levels of debt now extant across the globe there is potential for a serious crisis – physical gold stored outside of the banking system will perform its time-honoured function of protecting wealth. We offer clients fully, segregated accounts with the most reliable vaults in the world in safe jurisdictions such as Switzerland and Singapore. Today’s AM LBMA Gold Price was USD 1,206.75, EUR 1,085.33 and GBP 777.57 per ounce. Yesterday’s AM LBMA Gold Price was USD 1,219.65, EUR 1,090.24 and GBP 785.31 per ounce. Gold fell $17.40 or 1.4 percent to $1,208.20 an ounce on yesterday, and silver slid $0.56 or 3.17 percent to $17.12 an ounce. Yesterday, the gold price slipped for the first time in five days after an upside surprise in US housing data bolstered the U.S. dollar. April building permits came in at 1.14 million surpassing the estimate 1.06 million and housing starts also beat expectations at 1.135 million versus the analyst forecast of 1.02 million. In addition to the housing data the U.S. dollar was also strengthened on the news that the EU is going to ramp up their QE to buy more bonds in the next two months. The U.S. FOMC meeting minutes from the April 28-29 meeting will be released this evening at 1800 GMT. Investors will be looking for any clues on the timing of the Fed’s first interest rate hike in nearly ten years. Gold in Singapore near the end of trading fell 0.3 percent to $1,204 an ounce. Greece’s next deadline is June 5th for a 305 million payment due to the IMF. They will not be able to meet the deadline without a cash for reform deal with their European Union counterparts and the IMF. In late morning European trading gold is at $1,208.30 an ounce down 0.10%. Silver is off slightly 0.01 percent at $17.12, an ounce, while platinum is up 0.10 percent at $1,154.50 an ounce.